“Sticks and Stones can break my bones, but words will never hurt me.” From personal and professional experience I know that's not true. And the scientific proof has just become quite dramatic. I recently read in a professional journal that neuroscientists have discovered that the place in our brain that lights up when we are hit by sticks and stones, or when we step barefoot on broken glass is the same area that lights up when we are rejected. Rejection comes in lots of varieties. It can include a refusal to grant a request, and it means to throw away or discard as unsatisfactory, to repudiate, renounce, rebuff or deny. Think about the implications for marriage. In a relationship that is the most highly interdependent relationship we will ever be in, the potential for rejection is staggering. Who wants to feel the sting of rejection from the most emotionally important person in their life? Couples who are highly conflict avoidant deal with this problem by rarely bringing up anything controversial enough to trigger possible rejection in their partner. Their important disagreements are muted in an attempt to avoid delivering or feeling the sting of rejection. Couples who argue a lot with little resolution use words as sticks or stones and accumulate a ton of hurt along the way. But it isn't your fault. Really! Nature designed your emotional brain to record and store intense pain so you can quickly spot anything that resembles it and take necessary precautions to reduce the threat. This is a primitive, involuntary reflex that is hardwired in humans and other animals. We all store pain from various life experiences. The level and intensity of your stored pain affects how you experience the rejection, criticism or cold shoulder your partner delivers. And vice versa. Instead of being abstract, I'll use Ellyn and myself as an example of the reflex reaction to feeling a rejection. I make an agreement with Ellyn that will involve her depending on me. Let's say she wants me to collect my tax information by a certain date. Life happens, and I don't get it done by the agreed time. Ellyn expresses her disappointment. I get defensive. Ellyn (rightfully) believes I do not hear her distress. I express frustration about having limited flexibility in fulfilling my agreement. In addition, I remember so many other times when, even though I did accomplish something on time, it wasn't good enough for her standards. I make excuses, and what Ellyn hears is that she is not important enough for me to make the effort to follow through. My reaction is that Ellyn could chill a little. “For Pete's sake,” life isn't a Swiss train schedule. However, underneath the content of the problem, each of us feels that what is important to us got rebuffed, denied. In other words, rejected. To our emotional brains, the feeling is not much different than getting hit by sticks and stones. Now let's assume that Ellyn has a personal history of being let down by important people in her life when she was legitimately dependent on them. And let's assume that I have a personal history of being told I was inadequate in multiple areas of my life. This would add to the sting of rejection. We could each point to the other as the cause of our pain. And we each react like we are getting hit with sticks and stones. When your emotional brain has stored a great deal of hurt, each additional pain is both unbearable and trifling. We give a fifty cent response to a ten cent stimulus and the partner gets very confused. Imagine someone getting hit by sticks and stones. Their responses are extremely influenced by nature's reflex of self-protection. They are limited to fighting back, disengaging, or becoming deferential. Each strategy is designed to get relief from the immediate distress of the pummeling. 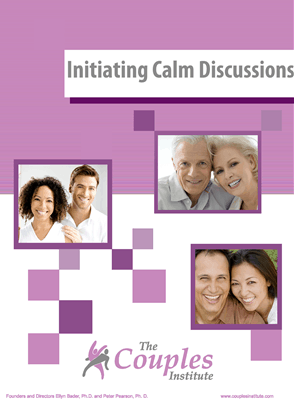 Before learning about how the brain processes painful information, I used to think it was sufficient to teach couples rational guidelines about how to talk to each other. What I didn't have until more recently were the techniques to help couples manage the self protective brain. My intentions were good, but my tools were limited. It is now possible to help couples calm the historic and current pain of rejection with methods that work far better than sheer insight and clenched-teeth will power. By working and practicing together, partners have a greater potential to heal their relationships. If I were to sum up what it takes to develop a flourishing relationship it would be developing the skills to have safer discussions about sensitive topics. How we treat our partner's vulnerabilities and insecurities and how they treat ours is what makes a relationship become magnificent – or anguished. If you have been having very unproductive discussions, don't be too hard on yourself or your partner. Your self protective brain has been doing what it is designed to do: create relief from the immediate distress of feeling rejected. And the self-protective brain is almost always at odds with all the other skills necessary for each of you to flourish.